Rich fudgy brownies topped with a soft chocolate mint layer. Topped with melted milk chocolate! It’s been quite some time since I shared a brownie recipe on the blog. December was the last time. Nearly 3 months. Then, last week my blog friend Jocelyn shared some Thin Mint Fudge Brownies on her blog and I couldn’t get them out of my head. Seriously. Earlier this week I made some Chocolate Mint Pretzel bites using the Duncan Hines frosting creations packet. I bought a few extra packets, just in case! I knew when making this brownie I would change a few things from Jocelyn’s recipe. I used my homemade brownie recipe as the base. I have nothing against brownie mixes, I just don’t usually have them on hand. It could totally work though for this recipe if you prefer. I also knew I wanted a soft chocolate mint layer. So instead of making a fudge layer, I made a chocolate mint ganache that you can sink your teeth into. Literally. Of course, to complete this recipe, it needed a final layer of milk chocolate. Agreed? These are some seriously rich, seriously delicious brownies! Just be careful, it makes a whole 13×9 pan and once you start nibbling it’s so hard to stop! Consider yourself warned! For the brownies, melt baking chocolate with butter in microwave dish for one minute. Stir and heat an additional 30 seconds. In a large mixing bowl combine melted chocolate and butter with sugars. Stir and add in eggs. Add flour and salt and stir until completely blended. Pour batter into a parchment paper lined 13x9 baking dish. Bake in a 325 degree oven for about 35 minutes. Remove and cool on wire rack. For the filling, in a small saucepan heat condensed milk until warm. Whisk in chocolate mint packet and white chocolate. Continue whisking on low heat until smooth. Pour over slightly cooled brownies. Allow brownies to set in refrigerator for 1-2 hours. Top with melted milk chocolate. ENJOY! 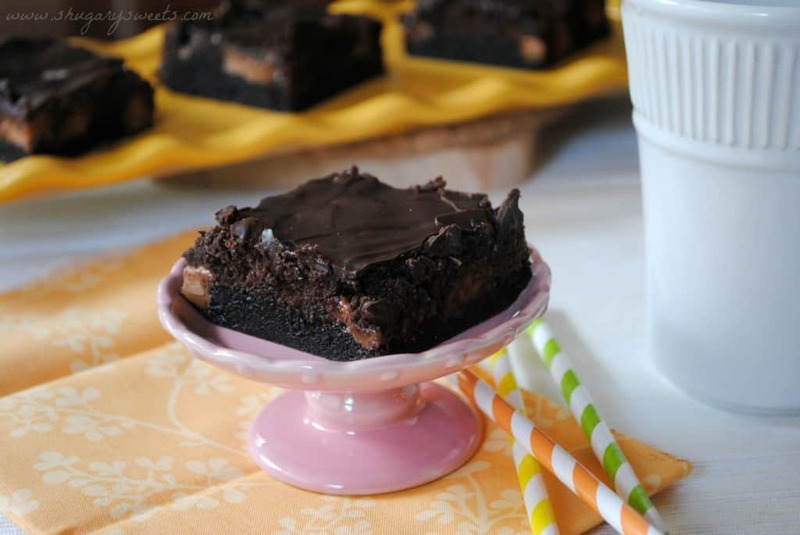 Milky Way Double Fudge Brownies: Just look how dark and moist these brownies are! 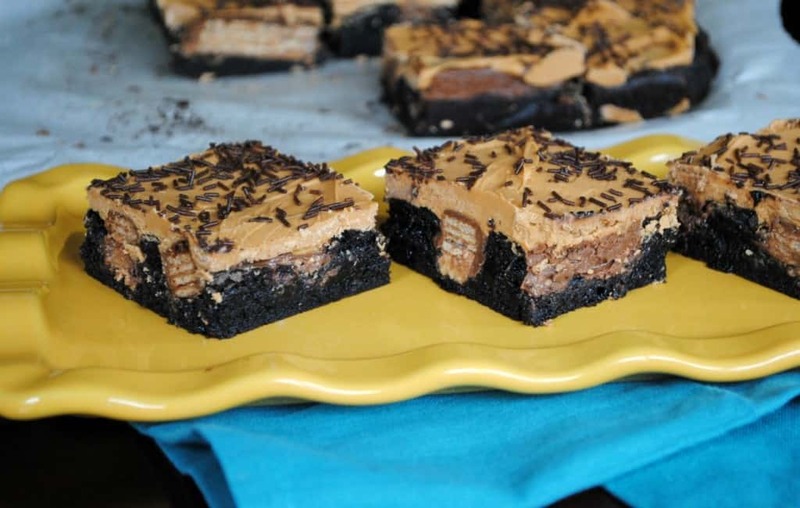 You can substitute your favorite candy in this recipe (Snicker’s work great, just sayin). Butterscotch Kit Kat Brownies: Soft brownie bottom with crispy Kit Kats topped with a layer of melted butterscotch! Oooh, I make a cool mint dessert that is very similar to this one. 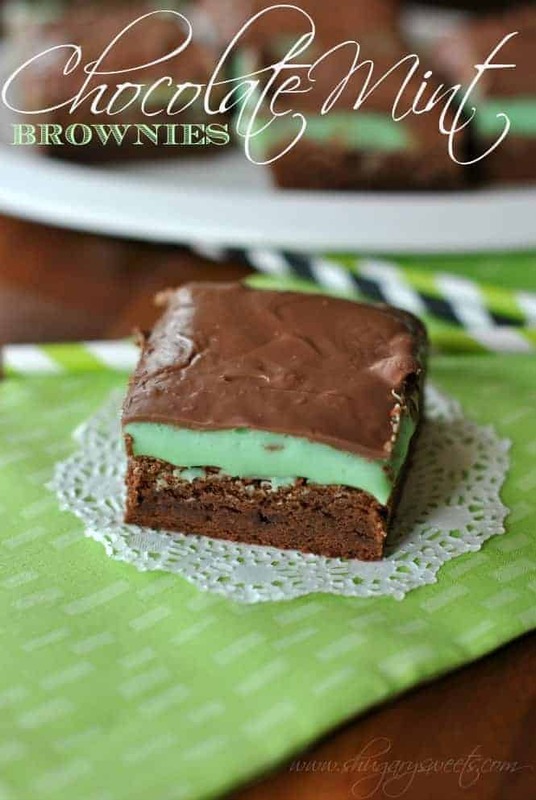 I love the chocolate and mint combo and know this would be a hit in our house! Chocolate and mint just go so nicely together! Can’t wait to see your brownies Sally!! I LOVE mint and chocolate together!! These look amazing! Gorgeous mint + choco combo and such perfect layers! I just posted choc + mint yesterday and last year, I posted choc + mint brownies around this time, and they turned out to be one of my most popular recipes of the year! Who can resist chocolate and mint?? Mint is in the air! Love it! 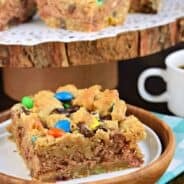 These brownies look so scrumptious and I love how they have thick layers, you can really get a taste and bite of each flavor! Chocolate and mint, two wonderful flavors. Cannot wait to try this recipe. These would be gone in a flash Aimee! Chocolate and mint – to die for! Oh these look wonderful! They remind me or grasshopper fudge which is my absolute favorite! I haven’t made grasshopper fudge in years! thanks for the reminder Audra! Yep, that mint layer is extraordinary! Now I’ll be thinking about it! Thanks Aimee! Yay! I am so glad my brownies inspired you to bake these yummy looking brownies. Love the ganache mint topping with the chocolate glaze! I do have to say though, my fudge layer on mine was actually quite soft…something about being on the brownies didn’t let it set up quite as hard as normal…which was actually a really good thing 🙂 Now I think I need brownies…better make them today before my new diet starts on Saturday!!! 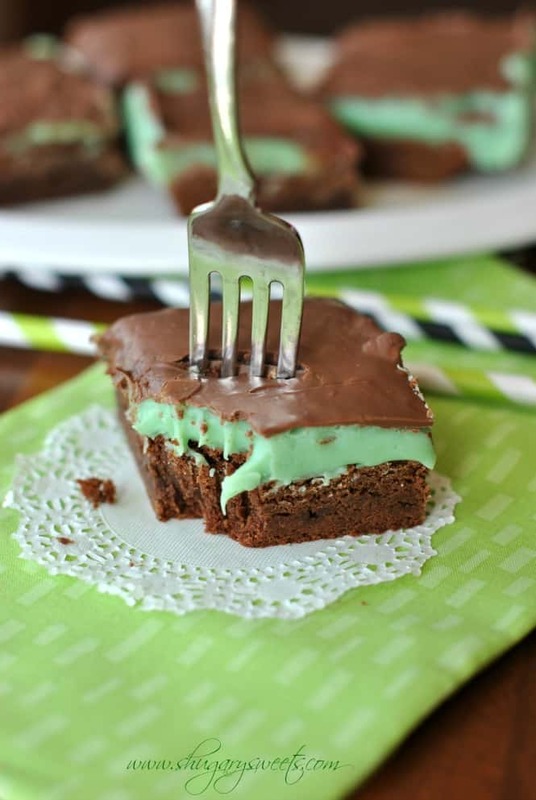 These look so sweet and fudgy and I love that minty layer-they’d be great for St. Patrick’s Day too! I always agree to a final layer of chocolate 🙂 These look prefect and I’m in love with the colors! Thanks Sues! Can’t go wrong with extra chocolate! 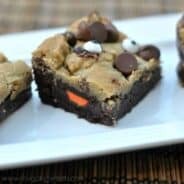 I love any kind of brownies and these sound amazing! I have to get my hands on these Frosting Creations. What a great use of the Duncan Hine’s frosting creation. I’m going to have to give those things a try. St. Patrick’s Day is all about something minty and chocolatey for me, and this fits the bill perfectly! Oh my gosh, I absolutely LOVE brownies and these look delicious! The mint looks a beautiful colour…I just want to bite your picture….lol. 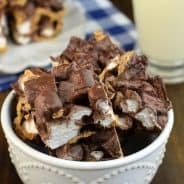 Of course it would be hard knowing whether to make these or the kitkat or double fudge that you also have featured….hm…maybe will have to make them all! Mint and Chocolate. There is nothing better, except to combine them! This recipe looks delicious! Can’t wait to make them. I made these last night to bring into work today. My co-worker just cut into them and came rushing to my desk to make me take a bite. OMG–rich and delicious with just the right amount of mint flavor. I usually steer clear of recipes calling for sweetened condensed milk (I’m not sure why) but this recipe will change that! 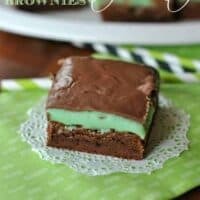 These mint brownies sound delicious! I definitely will try them!!!! The recipe looks great, however I really love the font you used for the ‘chocolate mint’ wording. Would you mind sharing what it is? I would love to make these but I cannot find the Duncan Hines chocolate mint frosting creations. Any idea where to locate this or what I can substitute with?